Joe B. Maldin, Sonny Curtis, J.I. Allison with Waylon Jennings. 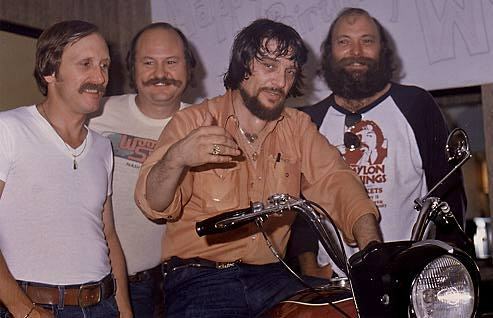 One June 15, 1979, Sheraton Hotel, Ft. Smith, Arkanas - The Crickets gave Waylon the Ariel Cyclone Motorcycle , that originally was Buddy Holly’s, for Waylon’s 42nd birthday. Photo - Steve Bonner.